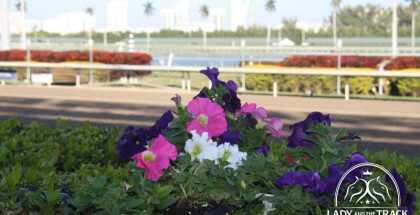 Inaugurated in 1990 as the Preview Stakes, the Holy Bull Stakes was created as a replacement for the Flamingo Stakes that was put out of commission following the closure of Hialeah Park Race Track, which has since re-opened to operate slot machines and run Quarter Horse races. In 1996, the Preview Stakes was renamed in honor of U.S.Racing Hall of Fame horse Holy Bull. Since the inception of the Holy Bull, the race has been contested at various distances, they change it up as much as I change my mind about horses, which is a lot, so I won’t go there. It has been upgraded to a (GII) for this years running and is staying at a mile and 1/16. The 2014 Holy Bull Stakes is the 10th race of the day on a card of 11 and set for 5:03 pm EST. The most wins by a trainer are by Nick Zito with three. I really miss seeing this guy’s horses on the Triple Crown trail. He used to bring a lot of game to the track for these three races. His horse Dialed In holds the record for a mile set in 2011 at 1:35.19. When held at 1 1/8 miles the record is held by Barbaro set in 2006 at 1:49.31. The 2013 edition was won by Itsmyluckyday in 1:41.8 and was held at 1 1/16 last year. The handsome son of Unbridled’s Song Almost Famous takes on some interesting possible Derby candidates in the Holy Bull Stakes this weekend and has been turning heads in South Florida. The Patrick Byrne trainee has three performances behind him. He was supposed to run in the Kentucky Jockey Club held at 1 1/16 miles but was scratched after suffering a bruised hind hoof. All three of his races have been at Churchill where he won his maiden first out September 13th going 6F and followed that up by a fourth-place run behind Delta Jackpot winner Coastline on October 27, 2013, who lost recently in the Smarty Jones. Last out he won an impressive six-length victory in a November 9th allowance going 1 1/16 so he does have a win at this distance on the dirt. He most recently worked 4f in 48.40, 7/25 at Palm Meadows on January 19th and on the 12th 5f in 1:00.60, 6/30. The race will be the tell-all for him here and we’ll see if Calvin Borel can get him to the wire in time from post #4. Cairo Prince suffered his first loss in three starts in the Remsen on November 30, 2013, where he took the lead in the stretch to lose in a photo by a nose to Honor Code. The Kiaran McLaughlin-trained son of Pioneer of the Nile/Holy Bubbette/Holy Bull gave an excellent account of himself in that race which was run in a slow pace and didn’t work well for a few of the grinders that return here. Cairo Prince has two other wins under his belt, one at Belmont on October 6th 2013 where he broke his maiden in the dirt at 6f and on November 3rd he won the (GII) Nashua Stakes at Aqueduct going one mile. He has some nice works at Palm Meadows recently breezing 4f in 48.40, 7/51 on January 19th. Jockey Luis Saez caught a little blame for that loss in the Remsen and he retains the mount here from post #7. Trainer Chad Brown is gutsy and patient with his son of Tapit Coup de Grace who ran his record to two wins with a powerful one-length victory at Gulfstream Park on December 15th, 2013 on the dirt. He stretched out from six furlongs to a mile, hitting the wire in 1:36. 3/5 under jockey Javier Castellano. In that race he settled behind Prudhoe Bay with an opening quarter of :23 2/5 and took the lead after the half to turn for home and win. Prior he broke his maiden at Aqueduct on November 9th going 6F in the dirt. He has some nice works at Palm Meadows with 5f on January 12th in 100.75, 7/30 and on January 19th 4f in 47.40, 1/52. We’ll see if he can stretch out here in this race. 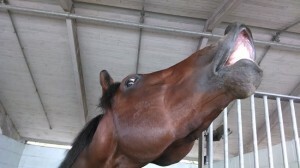 He’s already run over the track and he seems to love training at Gulfstream. John Velazquez is back to riding this weekend and gets the mount from post #1. I think this race sets up for a stretch battle between Coup de Grace and Almost Famous. If they burn themselves out in a pace duel, then I’m looking for Cairo Prince to grind it out for the win. I had a really tough time with this race as there are a plethera of uber talented colts here. I usually pick one for the win but I’m stuck. Depending on how the race plays out, I’m going with Almost Famous and Calvin for the win if they can hang in there and not burn out. I like Almost Famous and how he’s been training at Palm Meadows and from what I hear seems to be one of the greatest movers on this track. We’ll see how he handles the adversity and he should have some nice odds. I think Coup de Grace has tons of speed so I expect Almost Famous to be chasing him down the stretch and hopefully Calvin Borel will get everything he can from this horse. Almost Famous is going to have it tough with Cairo Prince grinding away from post #7. If the pace burns up with Coup de Grace gunning from the one hole, I see this Holy Bull grandson winning and making a name for himself in the gate for the Triple Crown. After that heart-breaking loss to Honor Code, Kiarin will have him ready to roll. So my top two picks to win are #4 and #7, with #1 to also hit the board. I wouldn’t be surprised to see Mr. Speaker in the starting gate the first weekend in May too and he could rumble here. We’ll see how he takes to the dirt after running on turf in all of his races and he has a smashing pedigree. I also like Conquest Titan down the road, he has some nice speed and out of Birdstone, maybe we’ll see him come Belmont time even though he’s a little quirky to me. If I play this race I will use a $20 Exacta with 4,7/1,4,5,6,7,8, depending on the odds for the second half of this exacta I may switch out some horses. If I wager a pick 3, I’ll use #1,4,6,7 in one of the legs. Good luck! 2. Financial Mogul 10/1 J.Ortiz/R.Violette, Jr.